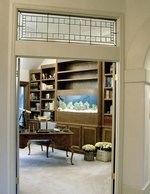 An overgrowth of algae can quickly destroy the health of a fish aquarium. Unfortunately, orange algae is a particularly rapid-growing form of algae that can be difficult to eliminate. Most often, poor husbandry has contributed to the overgrowth of algae, so in order to eradicate algae it's important to examine the care you're providing to your aquarium. Change the light cycle in your aquarium. Algae frequently grows when there's too much light in a fish tank. Keep the lights off in your tank for 12 hours a day. Consider using a timer to ensure the lights turn off at the same time each day. Avoid overfeeding your fish. Algae often grows as a reaction to extra organic matter in the fish tank. Only feed your fish what they will eat in 15 minutes. If there are extra food particles left after feeding, remove them with a net. Clean the water filter and replace its cartridge. If algae grows on the filter, it will continue growing in the tank. A clean filter can help get rid of the tiny particles and chemicals that help algae grow. Add a gravel filter or vacuum to your tank. The particles that collect on the bottom of the tank under the gravel can contribute to algae growth. Make sure your gravel is clean. Wait one week. If your tank is newly established, it's common for orange algae to start growing about six weeks after you set up the tank. After following the steps above in a newly established tank, algae may clear up on its own. Use a tank scraper to get rid of algae on the side of the tank. Often this will be sufficient to eliminate the algae if you are properly caring for your aquarium. Get an algae eater. If you have a freshwater aquarium and non-aggressive fish, an algae eater can be an attractive, practical and chemical-free solution to overgrowth of orange algae. The plecostomus, a large, attractive and friendly algae-eater is an excellent choice. Other algae-eating fish include Siamese algae eaters and red-tailed sharks. Snails of almost any variety are also great choices for algae control. Treat your tank for algae using chemicals. If the steps above have failed, completely drain the tank and clean all of its surfaces. After re-filling the tank, treat the water with a chemical algae remover. 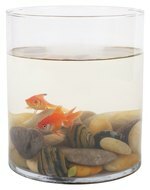 Most pet stores sell pellets that can be dropped into the tank to kill algae and prevent future growth. A chemical algae remover is necessary at this point because even after draining and refilling your tank, small amounts of algae may remain.